The Short Course "Aircraft Design" was given in Nanjing, China at Nanjing University of Aeronautics and Astronautics (NUAA) in the frame of the Summer Lecture Program 2018 from 09th to 20th July 2018. Lecturers from all over the world applied with their 200 course offers. 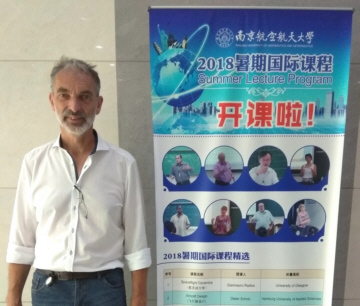 61 courses were selected by NUAA, inviting lecturers from 22 countries and 5 continents. Only few students in my course had access to a laptop, but all had a smartphone. For this reason, I presented Aircraft Design calculations with PreSTo-Classic for the first time also on smartphone. Students used their smartphone also for a very simple Wing Design exercise. Each participant produced this little table on the smartphone: WingDesign_simple.xlsx. Aircraft Design was illustrated with OpenVSP-Connect. 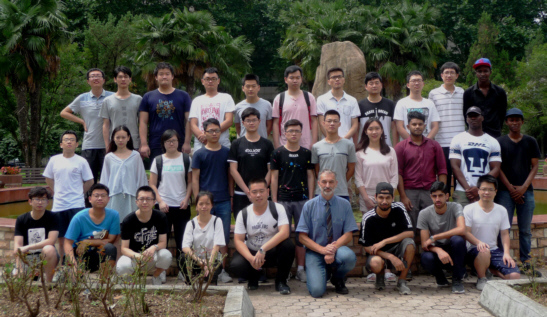 The Course held in Xi'an (see below) was extended with a Short Course "Design of High Lift Systems (2)", given from 28.11. to 01.12.2016 at TechSAT in Germany for 14 participants who where for the most part already among the participants in Xi'an. The topics this time: 1.) Slat/Flap Actuation, 2.) Mechanisms and Gear Trains, 3.) Slat/Flap Support Mechanisms, 4.) Slat/Flap Aerodynamic Load Estimation, 5.) Software: Direct Operating Costs for Aircraft Systems (DOCsys), 6.) Presentation of High Lift Systems from Selected Aircraft. A special Short Course "Design of High Lift Systems (1)" was given from 13.07. to 22.07.2016 at AVIC Qingan Group (QAG), Xi'an, Shaanxi, China. This short course discussed the needs for high lift together with high lift aerodynamics based on the Short Course "Aircraft Design". 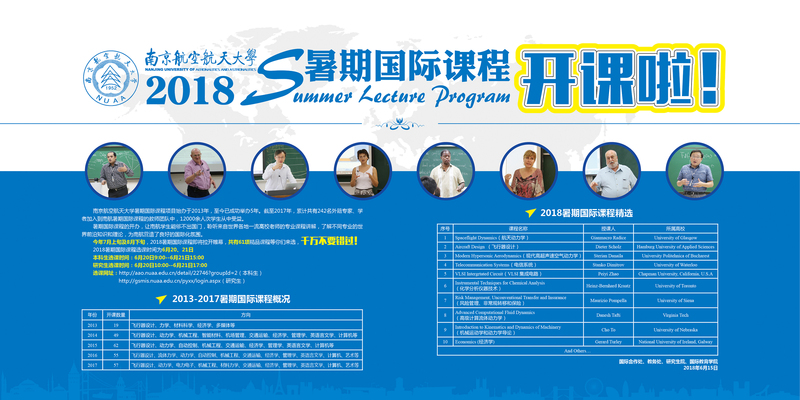 It was further based on material from my lectures "Aircraft Systems", "Development of Aircraft Systems" and the Short Course "Evaluation of Aircraft Systems". The material was complemented with special design techniques for high lift systems as well as many examples of high lift systems and components of passenger aircraft. 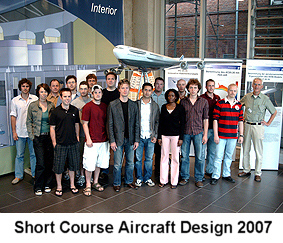 The Short Course "Aircraft Design" was offered at Hamburg University of Applied Sciences (HAW Hamburg) in the years 2007, 2008, 2009, 2010 and 2011. 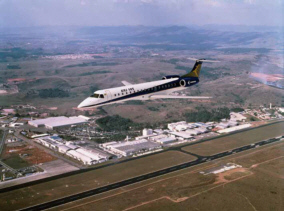 In 2013 an in-house short course coupled with consultancy work was arranged for Embraer. The course was given at Embraer's headquarters in São José dos Campos, Brazil. In 2014 the Short Course was organized in cooperation with the Russian State Technological University named after K.E.Tsiolkovsky (MATI) for a group of experienced "high potential" engineers. 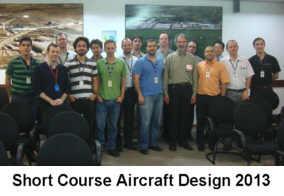 From 08th to 11th June 2015 I participated as lecturer in the Short Course "Airframe Systems Design" at Cranfield University. 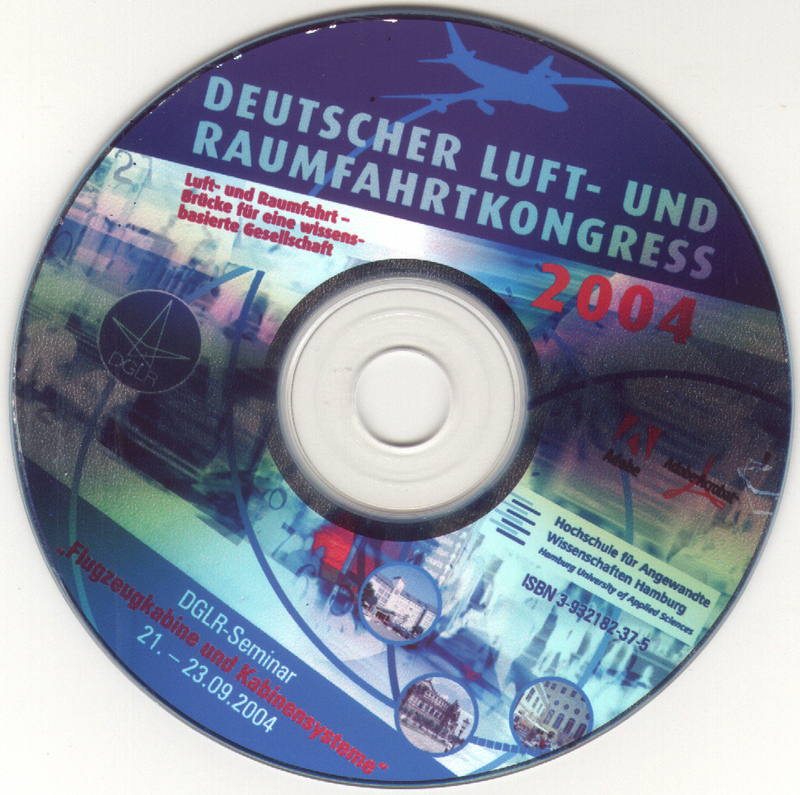 Distribution of Folder and CD by DGLR. I prefer to offer the complete Short Course for e. g. industry or organizations of higher education. The course can run as an in-house course at the customer's premises. Please bring forward your ideas! There is enough flexibility to adapt the content of the course and the timing to your needs. My activities since 2013 give examples how this can be worked out. The module gives an insight into the procedures and the multidisciplinary interactions of aircraft conceptual design. The process of iterative synthesis and analysis in aircraft design is illustrated. 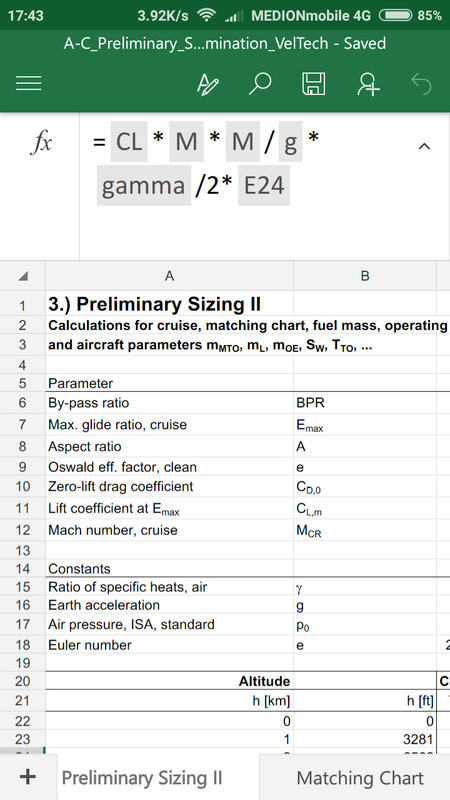 A software tool for preliminary sizing is demonstrated. Methods and data to enable case studies of subsonic aircraft design are provided. 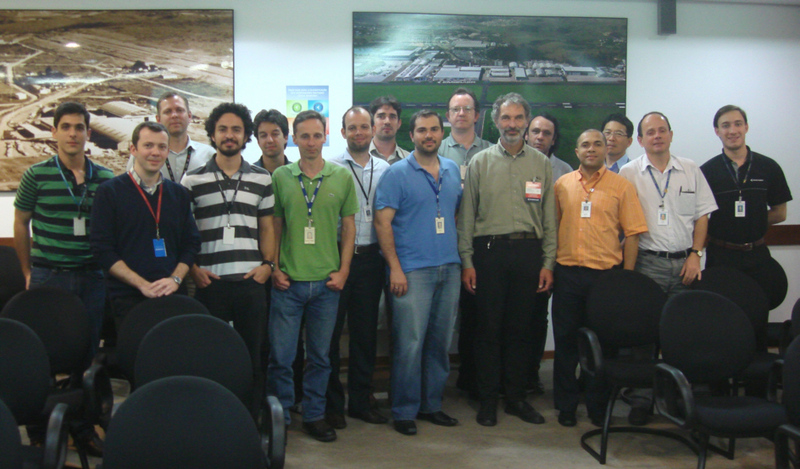 The module is intended for graduated engineers, equivalent professionals and/or managers. It is likewise suitable for specialists in search of a broader perspective as for newcomers to the field. 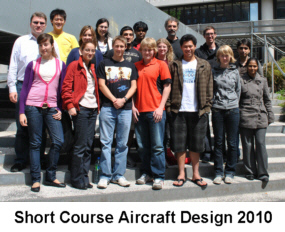 The course is also designed for aeronautical engineering students with an interest or for PhD students who can gain a good foundation for their research. know aircraft design parameters and methods. know the fundamental relationship of aircraft design parameters. be able to size and design an aircraft to the detail as covered during the module. have a capability to structure aircraft design activities systematically and efficiently. 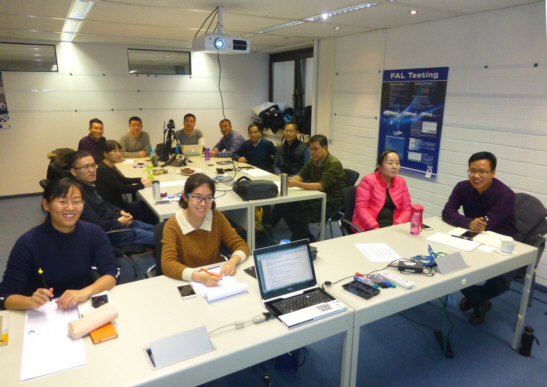 The module includes lectures, a tutorial, a team assignment, case studies (and a company visit to Airbus - in case the course is given in Hamburg). Speakers are senior experts from industry and academia. A comprehensive set of course notes is provided. Delegates are encurraged and to get familiar with the topic before arrival. The list of books on Aircraft Design from our university library gives you an indication of what books you may consult. 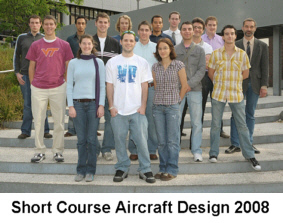 Introduction, development process, requirements, certification standards, aircraft configurations, engine integration, preliminary sizing, fuselage design, wing design, empennage design, prediction of mass and CG-location, landing gear design and integration, drag prediction, design evaluation / DOC, special aspects of military aircraft design. Delegates will be offered the possibility to work on an assignment. The assignment typically consists of an aircraft conceptual design study. Hamburg University of Applied Sciences and Airbus Operations GmbH (or at customer's premises). 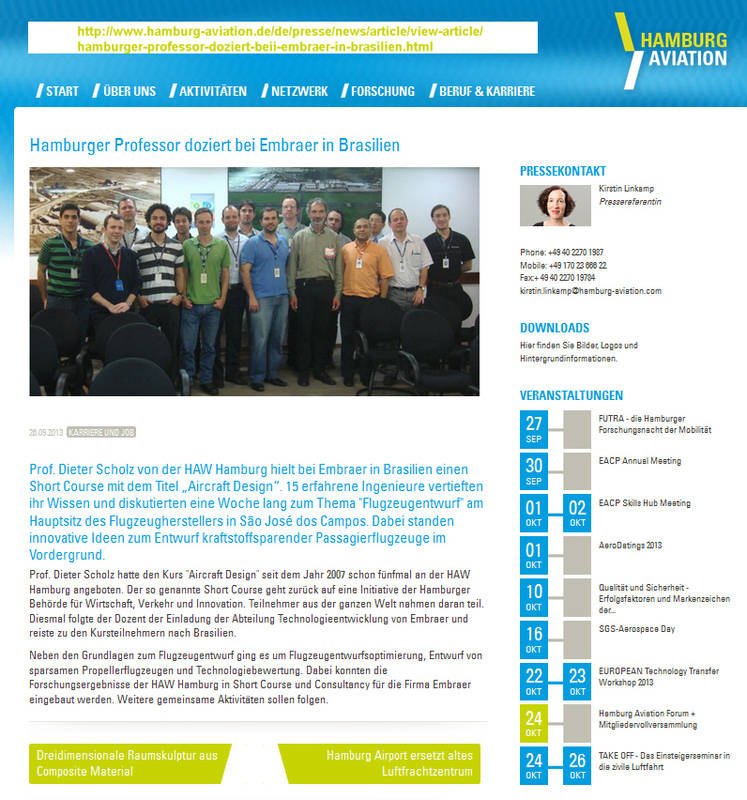 Professor at Hamburg University of Applied Sciences. 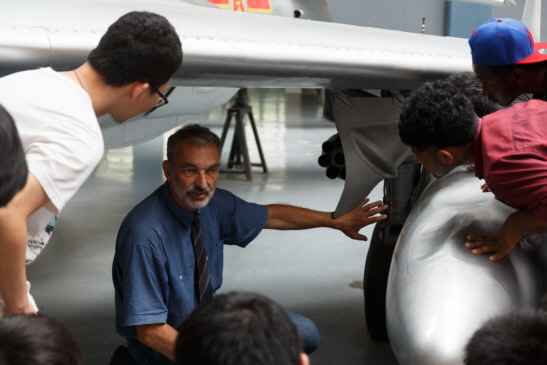 Teaching and research in the area of Aircraft Design, Flight Mechanics, Aircraft Systems. Engineer at Airbus from 1988 to 1992. Project Engineer at VFW, MBB, EADS, today: IBR, Aeronautical Consulting. Projects: US-FRG VSTOL Tactical Fighter Study. F-111 Crew Escape Module, F-15 Concept and Definition Phase. Pannap, TKF. Preliminary Design of Eurofighter. Programme Leader X-31 for MBB/Dasa/EADS. 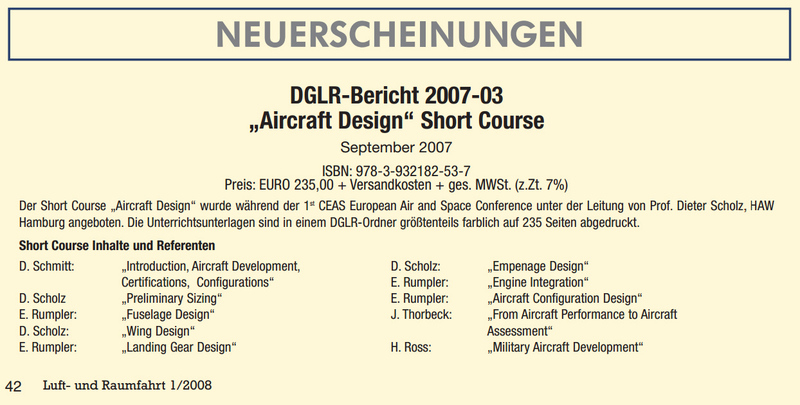 Lecturer at Technical University Munich: Design Requirements for Military Aircraft. Future projects engineer at Airbus in Germany since 1994. Overall design and follow up on A3XX. A380 competition studies in international project groups. Sketching, sizing, weight, drag and performance estimation. Discussion with component teams. Competition analysis with major focus on Boeing sonic cruiser and 787. Overall design A350 in international project group. Future projects engineer at Airbus in Germany since 1991. Overall design and follow up on A3XX / VLCT (Airbus & Boeing). A380 competition studies in international project groups. Sketching, sizing, weight, drag and performance estimation. Discussion with component teams. Team leader of trans-national group "Future Project Concepts". With over 12000 students Hamburg University of Applied Sciences (Hochschule für Angewandte Wissenschaften Hamburg, HAW) is the second largest institute of higher education in the Hamburg region and one of the largest of its kind (University of Applied Sciences) in Germany. Founded in 1970, HAW's roots go back to the 18th century. Its practice based teaching developed with industry, guarantees that participants can readily apply their knowledge. HAW aeronautical engineering graduates are well recognized and successfully engaged in all areas of aviation, nationally and internationally. 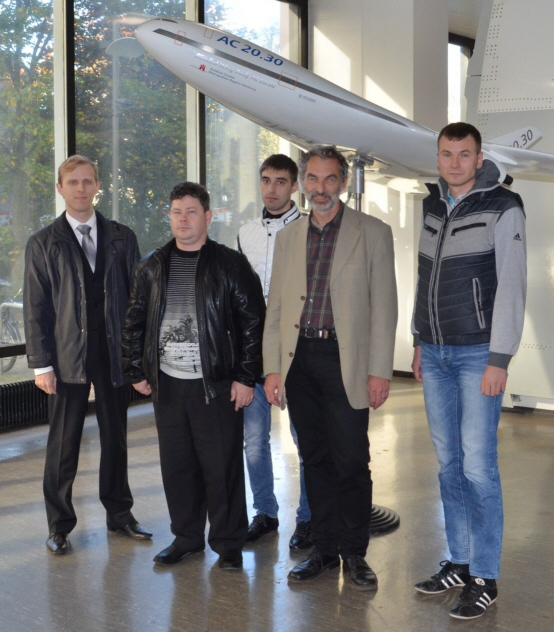 The university has established a research focal point in aeronautical engineering. All research is done in close cooperation with industry. 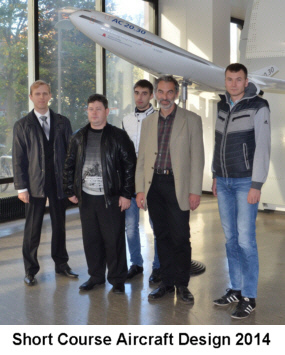 HAW's Faculty of Engineering and Computer Science has ordered the Short Course Aircraft Design from WINQ. was the continuous education branch of the Hamburg University of Applied Sciences. 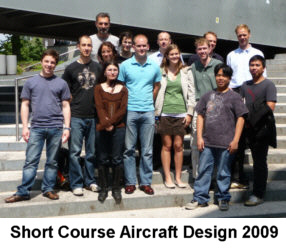 Starting in 1995 WINQ offered high-value seminars and courses and cooperated in running the Aircraft Design Short Course in Hamburg. 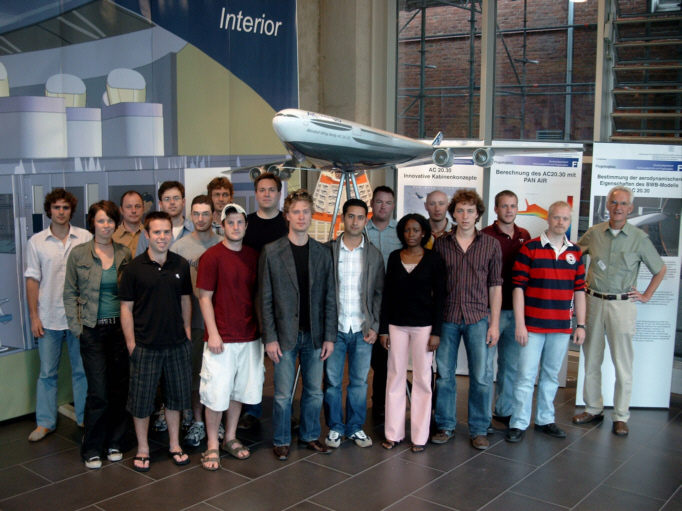 AEROero is the "Aircraft Design and Systems Group" at HAW Hamburg. 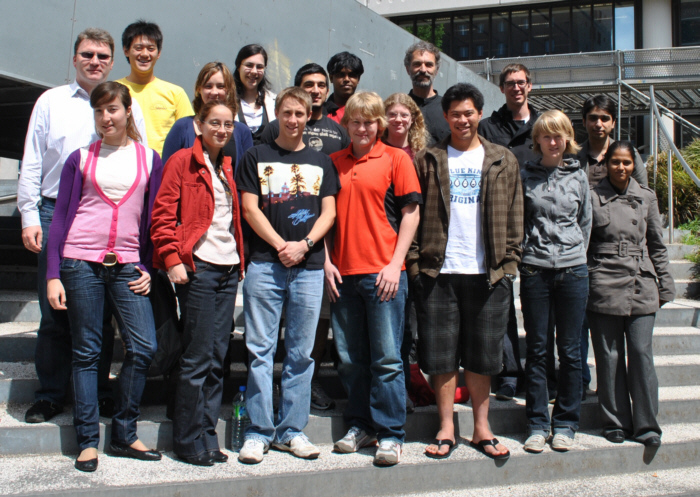 AERO's aim is to guide research assistants to cooperative dissertations and to conduct funded projects in research, development and teaching (short courses). 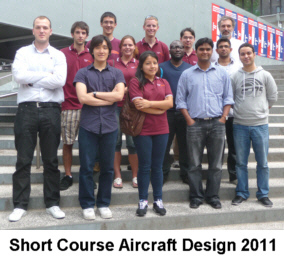 AERO is organizing the Short Course Aircraft Design. 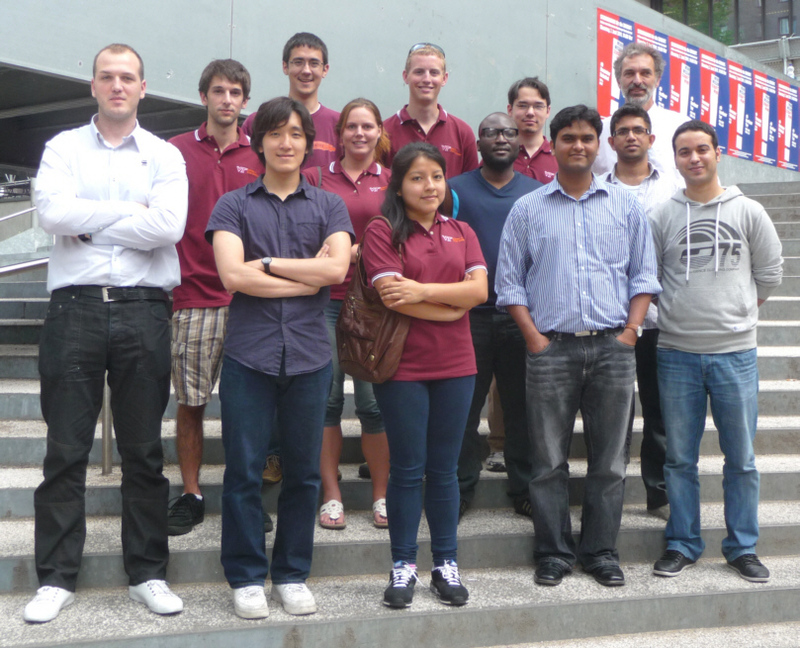 The last short course at HAW Hamburg was offered from Monday, 06 June to Friday, 10 June 2011. Please e-mail Prof. Scholz for further questions.